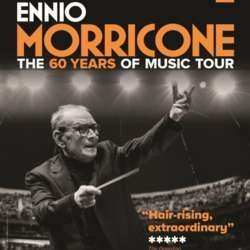 Ennio Morricone - "60 Years of Music"
You must be a member of the Oslo Live Spectators Group to attend this activity. Would you like to join this group? ENNIO MORRICONE will conduct his film music live in Oslo at the Telenor Arena on January 28th Protected content . The concert is part of his ‘60 YEARS OF MUSIC’ WORLD TOUR and will include Portuguese fado legend Dulce Pontes as a special guest singer. The production has been playing to sold-out arenas, across the continent and received standing ovations and overwhelming critical acclaim in the media. This concert in Oslo will be the very last time Maestro will bring his music to Norway. As soon I will be sending a message asking the attendees to wire me the money for the tickets.